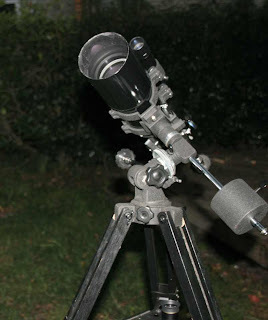 I love the StarBlast, Orion’s (Synta’s) 4-inch f/4 mini Dobsonian reflector. It is easier to get outside for spur of the moment looks at the night sky than any other telescope I own. But it’s not perfect, muchachos. It has to be collimated every once in a while, and it has a major drawback even—or maybe especially—for my uber-casual observing: cool down. My grab and go scope, which is supplemented by an humble but loveable pair of Burgess 15x70 binoculars, is not used for complicated and challenging observing projects, but it does need to be able to present a passable image of a planet, since that’s what I usually use it for, a casual look at Jupiter, Mars, Saturn, or the Moon. And it’s got to be able to do that quick like a bunny. Most of the time I am taking the scope from the warm house into the cold (for us) outside or from the cool house to the hot outside. It takes the StarBlast’s mirror a while to acclimate before it can begin delivering the good images it is capable of delivering. Even its wee 4-inch primary can take half an hour under the worst conditions, and that does not fit into the spirit of Chaos Manor South Guerilla Astronomy. If I decide I want to take a look at old Jupe during a commercial while I’m watching Doomsday Preppers, I want to be able to do just that. I don’t want to haul the scope outside and wait for it to behave. I could put the StarBlast on the porch ahead of time, but I don’t usually plan my homebound observing in advance—not hardly. I had a partial solution, I thought, Eloise, my SkyWatcher 80mm f/11 achromat, which I received “free” when I bought the Synta/SkyWatcher AZ4 mount. Eloise is pretty good optically, surprisingly good as a matter of fact. Being a refractor, she’s ready to go with zero cool down. But, like the StarBlast, she is not perfect; that long tube has proven to be an annoyance bordering on a problem. When I want to take a 2-minute peep at The Ringed One from the front porch, it’s a pain maneuvering her out the door on her mount. “OK, then,” Unk ruminated, “How about Woodstock?” My Short Tube 80 refractor, that is, whose coming to Chaos Manor South a dozen years ago was documented here. The 80 was my original grab ‘n goer and I loved the little telescope. But Yoda, the StarBlast, had more aperture and didn’t need a fussy GEM mount, and soon superseded if not obsoleted Woodstock. I continued to use the little feller for various tasks like Solar observing and guiding, but with the dearth of Sunspots over the last several years, and my acquisition of one of Orion’s cool 50mm guide scopes, poor Woodstock hadn’t been out of his case in… A year? Longer? 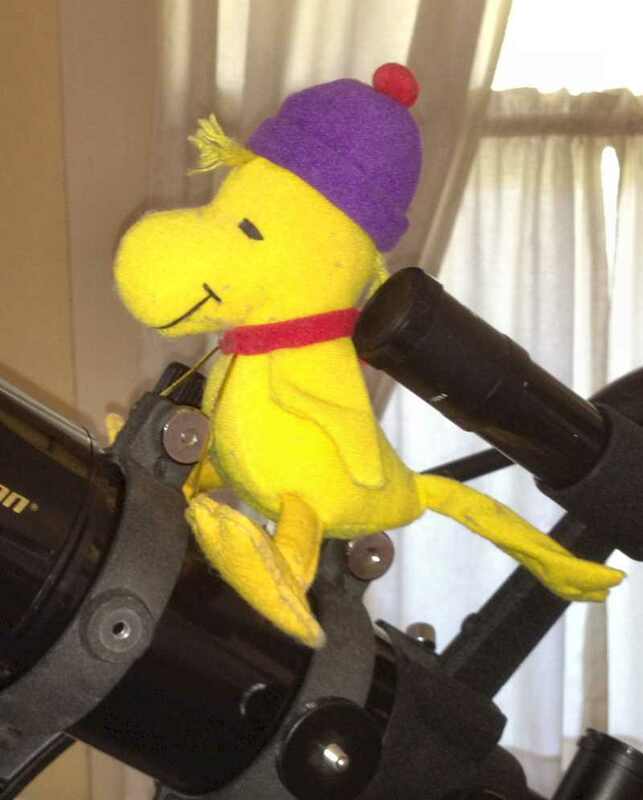 Since I didn’t want to fool with the EQ-2 GEM, I thought I’d see if I could mount Woodstock on the AZ-4 mount. Ought to be easy enough to waltz the alt-az rig out the door, even with its legs extended, with a shorter tube telescope riding on it. I’d already been cogitating on how to mount the Short Tube 80 on the AZ4, and in two shakes of a lamb’s tail, Woodstock was perched on the mount. The Short Tube came with a ¼-20 mounting bracket onto which you can bolt the tube rings that normally go on the scope’s EQ-1 German mount. I did that and screwed a Vixen compatible dovetail onto the mounting bracket with a ¼-20 bolt. It was indeed easy to get the little 80 out of the house and onto the front porch without doing major damage to furniture or telescope. I soon had the Solar filter in place and was checking out the Sun with a 12mm Plössl. Not bad. Not bad at all. Sharp, with the most prominent sunspot showing not just its dark bb-like umbra, but a fairly extensive penumbra too. All well and good. How would the 80mm f/5 compare to the 80mm f/11? I switched out Woodstock for Eloise, attached the filter, and inserted a 26mm ocular, which would yield a comparable magnification to that of the Short Tube 80. “Hmm…lots of smaller spots I didn’t notice with the ST80.” Back on the mount went the 80. Focusing more carefully—focus is much shallower with a fast scope—brought out most of the spots I’d seen with the f/11. I still thought the image in the higher focal ratio scope was sharper, but maybe it was only a little sharper. Might it be time to let Woodstock take up his long-lost duties as Chaos Manor South’s official grab ‘n go scope again? Perhaps. But the StarBlast, Yoda, wouldn’t go down without a fight. Years back, shortly after the StarBlast arrived, I’d had a shootout between him and the Short Tube 80 in Chaos Manor South’s backyard. It looked like it was time for a rematch. In this corner, we have Woodstock, the Synta Short Tube 80 achromat, riding on a single-arm Synta AZ4 alt-azimuth mount. Woodstock has not been in the ring in a while, but is still in fighting trim, with clean optics and a focuser that—I was surprised to note—is still smooth and easy after years of disuse. His aperture is 80mm and his focal ratio is f/5. On his tube is a minimalist but surprisingly good 30mm finder. In the other corner is Yoda, a Synta StarBlast Newtonian reflector weighing in at 114mm of aperture. His mount is a smooth and very functional single-arm Dobsonian that features an adjustable tension, ball-bearing race-equipped altitude axis and Teflon-on-Formica bearings for azimuth. His finder is one of Orion’s ubiquitous (and overpriced) “EZ Finder II” red dot jobs. 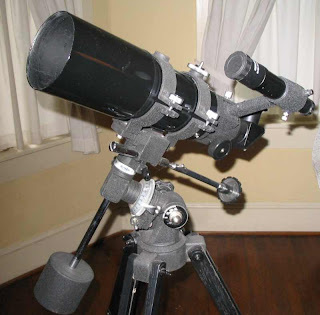 Both telescopes have 1.25-inch focusers, and the Short Tube 80 is equipped with a star diagonal, of course. Any number of eyepieces could have been used for this shootout, up to and including my 1.25-inch capable TeleVue 8mm and 13mm Ethoses, but I thought the 20, 15, 9, and 6mm Orion Expanse 66-degree AFOV eyepieces were more in keeping with the simple, inexpensive nature of the contestants. For lower powers, I used a classic Celestron Silver-top Plössl of 26mm focal length. When higher powers were called for, a 2x Orion Shorty Barlow and a 3x Knight Owl ED Barlow were used with the Expanses as necessary. The place to test the mettle of the telescopes was obviously Mars, which was just past opposition at the time of the bout. It’s a challenge for any scope, since it is small even at its closest and most of its features are of a distinctly low contrast nature. I’d been rather impressed by how well the StarBlast had done on it a week or two previous, and wondered if the Short Tube 80 could possibly keep up. I did recall I had some excellent views of Jupiter when Woodstock was new. I’d seen the disk of Io transiting Jupe’s face—the disk, not just the shadow—so I wasn’t ready to count him out. While waiting for The Angry One to clear the trees, I sent both telescopes to the Moon. I started out at low power, if not at the lowest power I could have mustered—I’ve got a 40mm Plössl around here somewheres. One of the major attractions of these two richest-field-telescopes is, after all, their extremely low power, wide field capability, and I wanted to give both a chance to show that off. Short Tube 80: What a lovely image of a nice, gibbous Moon! Framed by a huge expanse of sky and the chimney top of the house next door, it was just exquisite. The terminator was dead sharp. “But how about the COLOR, Unk? How about the dreaded color purple?” Chromatic aberration is always the 64 dollar question when talking “achromat,” especially “fast achromat,” ain’t it? There was some color, but it wasn’t purple. With my eye on axis, there was a fairly subdued amber fringe along the limb. Placing my eye off axis, it took on a purple hue, but was not at all disturbing. If you are going to have a fast optical system, which is what most of us want in a grab ‘n go, you are likely gonna have some field curvature and/or coma. How was Woodstock? Moving the Moon around in the field, I found the image was pretty sharp in the simple-design eyepiece till about 70% of the way to the field stop. Even past there it was OK, if not razor sharp. StarBlast: The eyepiece delivered slightly higher power in the StarBlast, but in most ways the image was identical to what I’d seen in the refractor. Good and sharp. Excess color? There was none. And I don’t just mean there was no amber or purple stripe along the limb, but that the whole disk of the Moon looked truer in color. In the Short Tube, the Moon had a slight but noticeable yellowish tint, but in the StarBlast it was a pure, silvery hue that just looked more natural and “better” in comparison. On the other hand, the coma inherent in a fast reflector assured that the refractor pulled ahead in the edge-of-field department. In the StarBlast, the image began to go mushy about 50% of the way from the center of the field, and at the edge it was rather icky indeed. I also noticed the fairly obvious shadow of the StarBlast’s secondary mirror with this bright target at such low power. Woodstock was victorious in Round 1. Despite the reflector’s lack of color, the refractor took the laurels due to its flatter field and lack of a secondary shadow. At 27x, the image of the Moon delivered by the Short Tube was still amazingly sharp. The higher magnification began to bring out details, too, like the terracing of the walls of the great crater Copernicus. Chromatic aberration? No more than what was seen at 15x. The 30x image in the StarBlast was unmistakably brighter than the 27x image in the refractor. Otherwise? The level of detail visible on the terminator was about the same as that in the Short Tube 80. Once again, the color appeared more natural in the reflector than in the refractor. 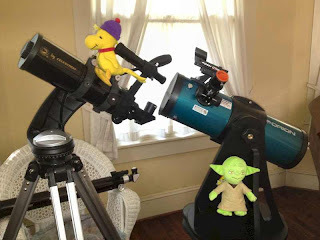 I only tended to notice that when I moved back and forth between the telescopes, though. At 40x, a good scanning/casual observing power, the refractor was still delivering the goods—and how. The terminator was an amazing welter of tiny details, with Gassendi, where the Sun was just rising, looking impressively sharp. How about areas of the disk away from the terminator? Looking good. The maria stood out with decent contrast. Unfortunately, chromatic aberration was becoming more obvious. Color fringing on the limb was harder to ignore, and I thought I detected a hint of purple in the shadows of the terminator detail. Not crazy bad, but there. Yoda laughed. This is where the StarBlast began to pull ahead. Not only was the absence of spurious color immediately obvious, the terminator detail was good and sharp. It was sharp in the refractor, but it was just a little sharper in the reflector. I also noted that the detail on the disk away from the terminator, Tycho’s ray system for example, was higher in contrast and easier to see in the StarBlast. Kicking up the power a notch delivered more detail with Woodstock. Small detail, like the craterlets that litter the floor of Clavius, popped right into view. I liked the look of it a lot. Alas, away from the day-night line, the disk was looking decidedly soft. Not bad, mind you, but not quite as sharp as at lower power. At 76x, the level of detail visible with Yoda was impressive. Copernicus, with his complex central peak and fascinating walls, was just nuts. The arc of small craters in Clavius was visible in the refractor, but it was sharper in the reflector, and I was able to see some smaller features on the crater floor that were not apparent in the ST80. The disk away from the terminator looked every bit as good as it did at lower power—much better than in the Short Tube, in other words. Little Woodstock was still on his feet, but was looking wobbly. The Short Tube 80’s image, including the terminator, was getting undeniably soft. Surprisingly, chromatic aberration, though certainly noticeable, didn’t look much worse than it had at 66x. Despite the slight softening, there was plenty of detail to be seen. Gassendi was looking very complex. Offsetting that, the image was now also on the dim side. 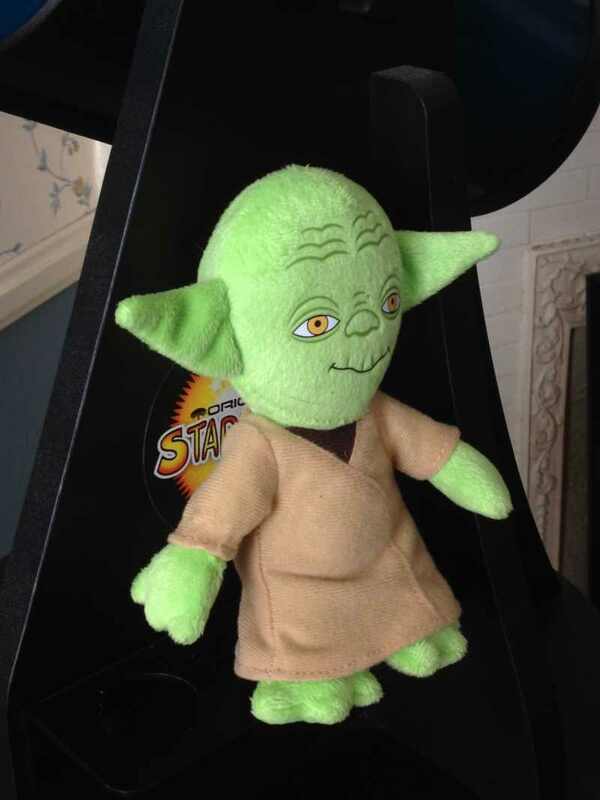 Yoda? At this magnification, Luna in the StarBlast reminded me very much of the way it looked back in the day in my long focal length Palomar Junior 4.25-inch reflector. Tons of detail on view everywhere and as sharp as ever. If Woodstock was wobbling before, he was stumbling now. The Moon’s image was soft overall, softer than ever, and I wasn’t seeing any more detail than I had at lower power. Surprisingly, color was still under control. 200x was somewhat useable, and might have been a wee bit better with better seeing, but it was a lot to ask of this f/5 achromat. Yoda laughed again. He took on 228x without complaint and seemed ready for more. The image was getting dimmer—this is a 4-inch telescope—but it was still astoundingly sharp. The bright spot on the floor of Plato that marks the most prominent of his craterlets winked right into view. Gassendi was superb and so was Clavius, and I was definitely seeing more detail than I had at lower power. Due to the depredations of clouds, Mars had to wait till the next night. When Barsoom put in his appearance, it didn’t take long to determine what was what. Let’s make this short and sweet: The Angry Red Planet laid Woodstock out on the canvas. At about 100x, the image was pretty good, but that was far too little magnification to do more than just show the bright red “star” was indeed Mars. Pumping it up to 200x, just enough magnification to reveal details, made the disk of Mars a mess. No combination of eyepieces or Barlows helped. 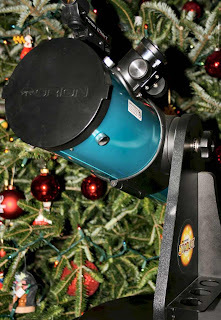 The small refractor was well and truly done. So the victor was the StarBlast? Sorta. Yoda disappointed a little bit. Yes, at 200x, the image was much cleaner than in the 80. I could see the polar cap, and I could see hints of dark features, but it was clear the scope needed at least a little while to adjust to outdoor temps. The image was good, just not as good as I knew it could be in this amazing little scope. The real and surprise winner, I guess, was the 80mm f/11 refractor. On a whim, I hauled her out, and Eloise produced simply outstanding images given her aperture. Even at 300x, Mars was a good-looking ball showing fleeting surface detail and a polar cap. I suppose the contest had morphed from a prizefight into a horserace with the 80mm f/11 coming from behind to best the StarBlast by a nose. So what now? Status quo. The idea of resurrecting the Short Tube 80 was a good one, and I suppose he could do alright once in a while, for a casual look at the Moon, maybe. But there is no denying he is the weakest of the three telescopes. I reckon Yoda will remain the primary g ‘n g scope at Chaos Manor South. But when I need top-notch images in a hurry without cool down, I’ll just have to wrestle the 80 f/11 out the front door. I’m not sure there is a perfect grab ‘n go for me. 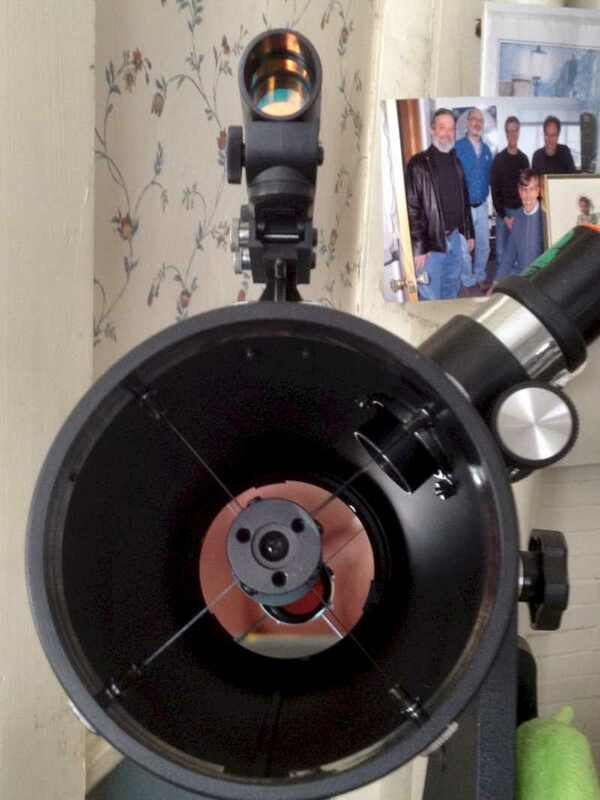 It would have to be something like a short and light 4 – 5-inch APO refractor, and even if I found one short enough and light enough to serve, I probably wouldn’t want to pay for it. If I ever do achieve grab and go nirvana, I guar-ron-tee y’all will be the first to know about it, muchachos. Rod great blog , small scopes are fun great during the work week, have you ever tried to get a used Brandon 94 for grab and go? You can use it on a VIxen Porta or as I have done on a quarter half hitch mount. The C90 ( orange tube vintage) is also a great grab and go! Hi Rod. For Grab n Go, how about that WO Megrez90 you used to have? I have one on a Vixen Porta mount and its great for when I can't be bothered to set up the Big Boy. I often like to see how far I can get with Chuck Wood's Lunar100 (the higher the number, the harder the the target) and the M90 can do suprisingly well. It's also good for having a quick review of the celestial highlights of the night/hour. It does weigh a bit though, so it's not something to sling over your shoulder and jog up the nearest mountain with. It is an absolute joy to use but I have to say that for the money, you can get much more aperture so I wouldn't recommend as a main scope, especially for DSO's where there is a bit of light pollution to contend with. I leave my C90 on a heavy duty CF tripod with a heavy duty video head. I have "skyeye" for my android and using a 35mm ep I can find things pretty quickly. My C90 has been with me since 1996 and Its just a nice little scope. I don't know how good the special coatings are ,but using a good diagonal and my Celestron Ultimas the images are quite pleasing. For grab&go I too use an St80 but with a 2" focuser. This allows fitting of the bottom element of a 2" GSO Barlow and a minus-violet filter both within the focuser tube. Coupled with a 2" GSO diagonal it makes for a great travel scope, and breaks down easily for carrying as airplane hand baggage. An SLT go-to mount is a fairly lightweight companion for checked baggage, and an alt-az manual for faster access when manually tracking with a solar filter. I had to agree to sell my ST80 in order to have Hubby agree to let me buy my ETX-80. And frankly, the ST80 hasn't been used much since I bought my C5, which is a great g n g scope even if not really cooled down. I can move it outside on its CG-4 mount in one piece without disassembly. BTW, I tried to post comments several times on your filter reviews, but they never appeared. I think there may be a bug there. "Blogger (Google) has recently introduced a new version of their software. It is not compatible with Internet Explorer, and it is FULL of bugs. :-("
Thanks, Unk, for an excellent writeup. This is extremely useful stuff. One thing I've always liked about small reflectors is that you can fiddle with the collimation while looking through the eyepiece. It certainly helps short f/l scopes like the StarBlast punch above their weight. Firefox is fine for _looking_ at Blogger...the problems come when you post a blog. If you want it to go right, you have to use Chrome now. I wonder why _that_ is? LOL.